"Tania...you and I had only one moment.." said Alexander, "A single moment in time, in your time and mine...one instant, when another life could have still been possible. "This might very well be the most exquisitely-written blend of historical fiction and romance in one book that I have ever read. Dare I even say that this heart-wrenching and beautiful tale has taken over the top spot from Outlander? I know. I can't believe it myself. Both are 5 star books and both will stay on my all time favorites list. I honestly didn't think anything else could compare to Gabaldon's epic love affair of Jamie and Claire. 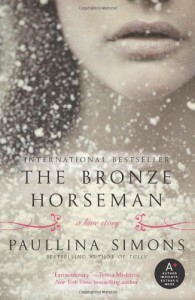 I thought wrong.So many people compare The Bronze Horseman to the infamous Outlander series when the only things that the books have in common is that they are lengthy historical fiction books featuring an epic romance. Otherwise, these two stories have absolutely nothing in common. Granted, I haven't read enough of Tatia and Alexander's tale to think that their love story encompasses the miraculous wonder of Jamie and Claire in Outlander, yet I will say that T&A's (yes, I did giggle as I typed T&A) story is no less engaging or heartfelt. The greatest accomplishment of TBH is that the story never falters the way that Outlander tends to in parts. Every single moment is a recorded moment in time. A beautiful moment in time at that - whether the moment is painful, torturous, sensual, or endearing. Because I devoured every word, every page, this gives TBH the edge over Outlander (which I admit to skimming in a few parts, even though I loved the book as a whole). If you tried Outlander and found that you weren't a fan Gabaldon's heavy-handed way of writing, you might find that the style of writing in The Bronze Horseman works better for you. This is a much more fluid and less fussy style of written word.Tatiana and Alexander should have been doomed from the start. There is no way that two normal people could possibly survive impossible obstacle after impossible obstacle. Everything from an unfortunate age difference, being promised to other people, war, starvation, death, fear of capture...there were insurmountable odds at every turn for a couple who were not supposed to be together, yet fought to hold on to what they wanted the most.Please, God, Alexander prayed. Let her not love me anymore, but let her live.Alexander is a soldier in the Red Army, fighting for a country he does not belong to. Tatiana is an innocent child, serving all those around her who would take advantage of the girl with a never ending supply of compassion. Be prepared for having your heart ripped out over and over. This is not an easy story to read, but it is a story well worth following. The details of living among war are not pretty. You will read about people fighting through injuries and deaths of loved ones and holding on after going weeks on end without but a scrap of food. If you thought that the starvation was hard to read about in Laura Ingalls Wilder's The Long Winter, consider that instance to be a walk in the park compared to this one. The strength of spirit from our main characters is incredible to watch. The sacrifices that people make for one another in the name of love is so incredibly emotional to watch.Under a black smoky sky, amid burning woods, Alexander carried Tatiana on his back six kilometers to the next station.This is not a one-sided relationship. The care that Tatia gives her Shura in return is just as much of an effort.This is a tale of how the heart will fight for what it wants the most. I have nothing left to say. Just read this book. There's no way for me to sell it other than to say that if you know how picky I am, this book must be extra special to earn such high praise from me. If you love historical fiction, read it. If you love epic war-time love stories, read it. "Shura, how can we have such a closeness? How can we have such a connection? Right from the start. ""We don't have a closeness.""No?""No. We don't have a connection.""No?""No. We have communion."